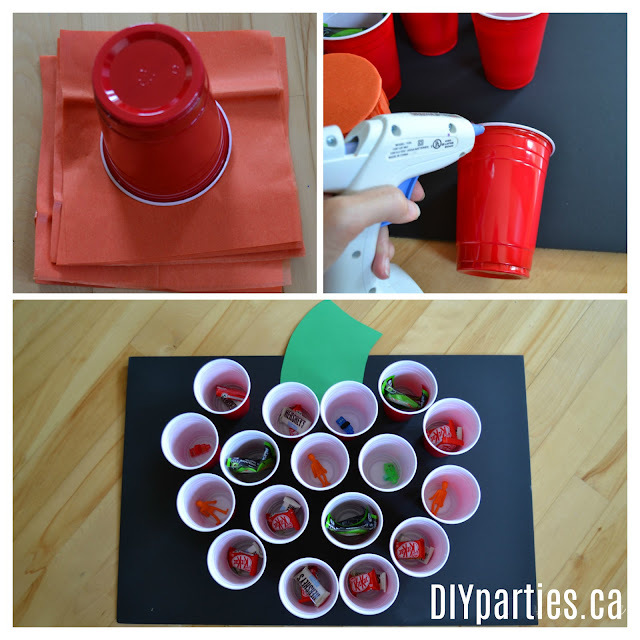 Several years ago, I created a simple DIY party prize punch. My goal was to create a fun way to distribute hockey cards at my son's birthday party, so I headed to the dollar store and purchased some supplies. 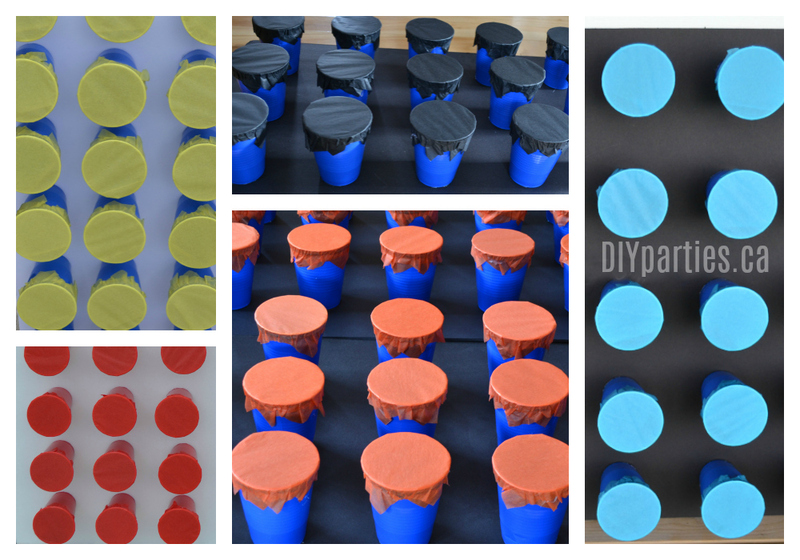 I made a fantastic prize punch with: a piece of foam core, plastic cups, tissue paper, and a glue gun. Since my first creation, I have made many different versions for all my boys' subsequent parties. 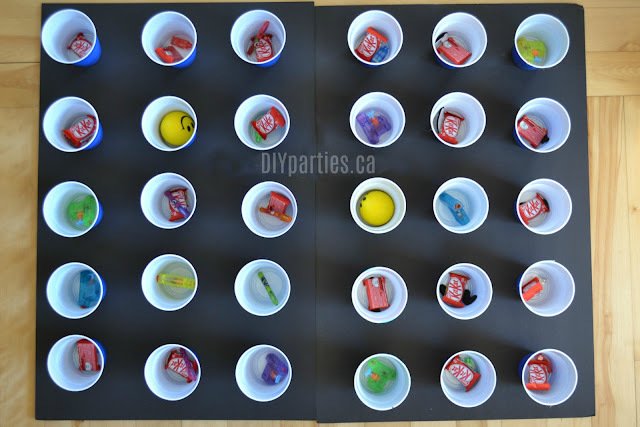 Today, I am sharing everything you need to know to make your own prize punch... and trust me... if you can work a glue gun, you can totally make this DIY party game. 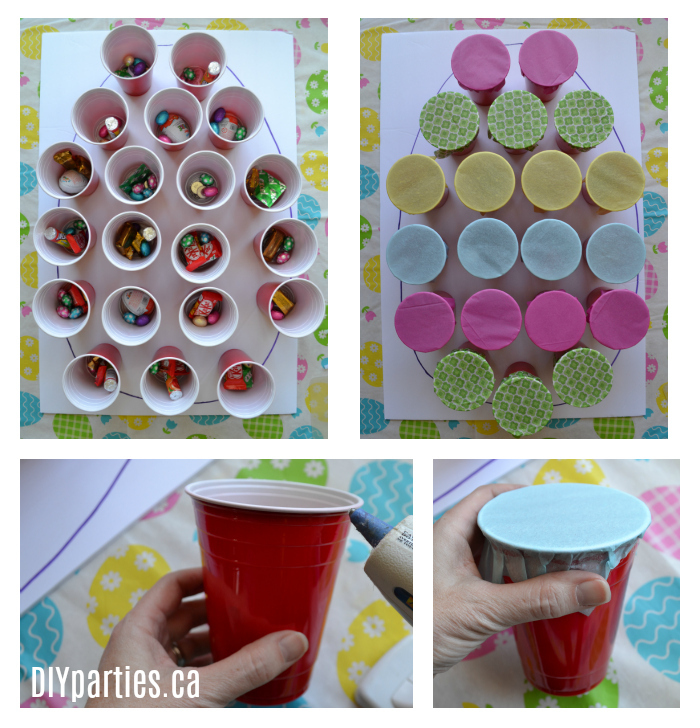 1) Fill plastic cups with prizes. 2) Cut squares of tissue paper slightly larger than a plastic cup. 3) Use a glue gun to make a ring around the top edge of the cup, and quickly seal the tissue paper over the top of the cup. Repeat for all the cups. 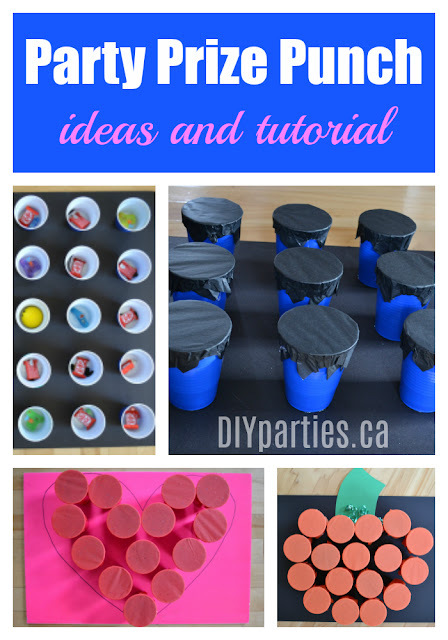 4) Use hot glue to attach the base of the cups to a piece of foam core. The best thing about prize punches is that you can fill them with whatever you want. My first prize punch was filled with hockey cards. I've also used mini chocolate bars, coins, candy, and dollar store trinkets. You can also make prize punches in different shapes and designs. I made a pumpkin for Halloween and a heart for Valentine's Day. You could also make a Shamrock for St.Patrick's Day, an egg for Easter or a tree for Christmas. 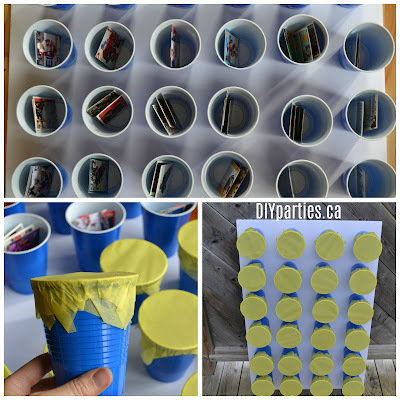 You can also make them coordinate with any party colour scheme. I've also coordinated them with sports team colours and made them to match NERF gun bullets. Usually the party guests just poke through the tissue paper, but you can be creative. For our carnival party kids threw bouncy balls, and at our NERF party guests had to shoot through the tissue paper. 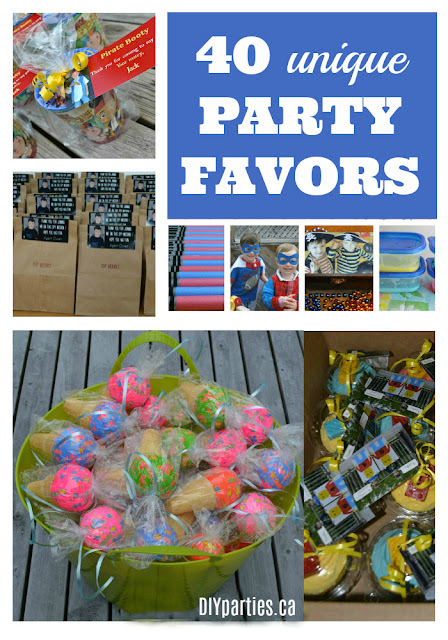 Party prize punches really are easy and inexpensive to make, they add a custom detail to a DIY party, and they are a lot of fun. Give one a try at your next party. I guarantee that if you can work a glue gun, you can successfully create one using my step-by-step tutorial. Let's face it... good food is the cornerstone of a great party -- it's something that everyone will talk about and remember long after the guest have gone home. Setting up a fantastic food table isn't difficult. In fact, with a little effort, party food can easily be pleasing to the eyes AND the tastebuds. Today, I am sharing some tips and tricks for creating the perfect party food presentation for any party theme. 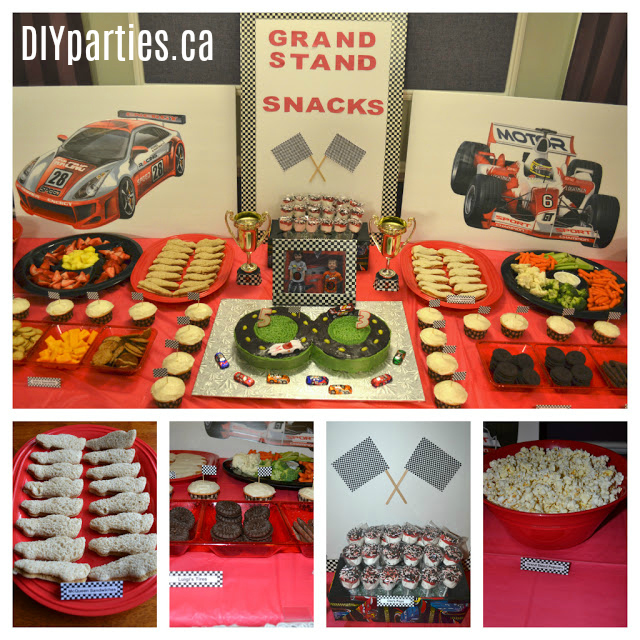 CARS party food - Create a "Grand Stand Snack Bar" that is sure to be a rip roaring hit with party guests. Use dollar store foam core and decals, duct tape, and letter stickers to create signage. 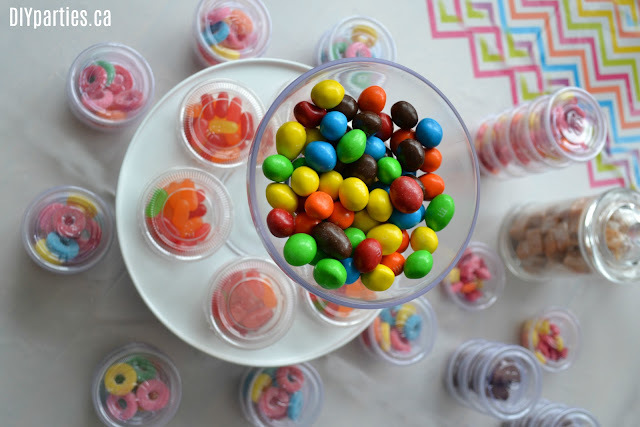 Then, fill the table with fun snacks named after characters from the movie "Cars". Luigi's Tires (chocolate cookies), Mater's Diptsticks (chocolate covered lady fingers), McQueen Sandwiches (sandwiches cut out with a car shaped cookie cutter), Grand Stand Popcorn, Fillmore's Fuel (juice), Sally's Specialities (fruit, cheese, and crackers), Finn's Finest (licorice), and Doc's Pops (marshmallow pops dipped in red chocolate with black and white sprinkles). You'll also want to serve a simple race car cake for dessert. 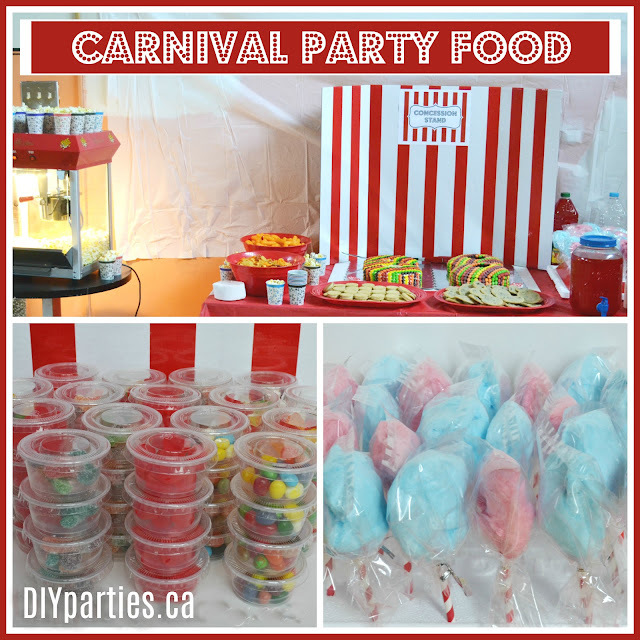 Carnival party food - Create a "Concession Stand" backdrop using a dollar store cardboard tri-fold, a sign printed on the computer, and some red duct tape. Then, add some pizza, popcorn, chips, cotton candy, and other candy treats... and don't forget a fun cake! 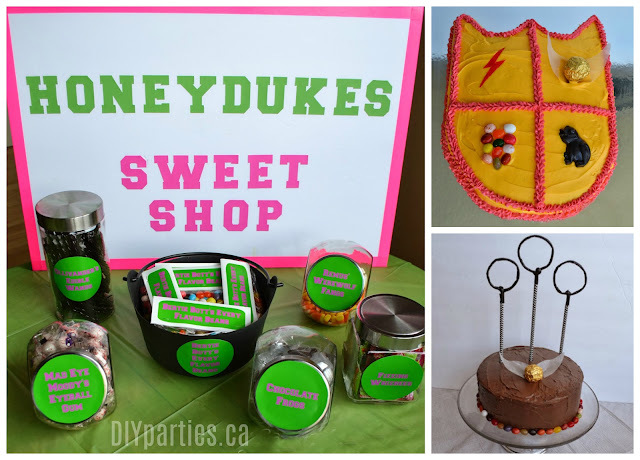 Harry Potter party food - Every Harry Potter fan knows that "Honeydukes" sweet shop has the most magical food. 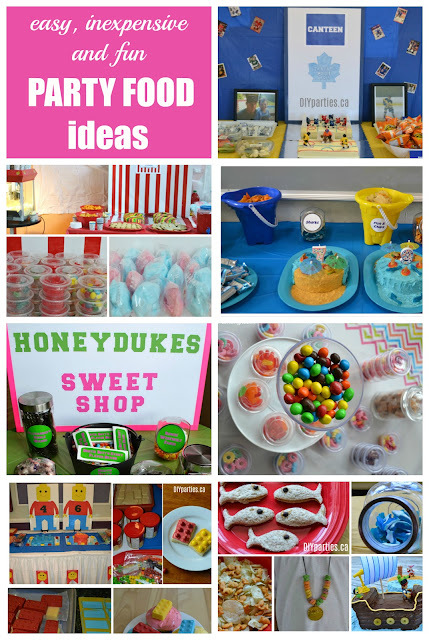 Set up your own DIY sweet shop by making a sign from a piece of dollar store foam core, some colourful duct tape, and some letters printed on a computer. Then, serve treats like: Bott's Every Flavour Beans (no name gourmet jelly beans), Ollivander's Edible Wands (black liquorice), Fizzing Whizbees (popping candy), Mad Eye Moody's Eyeball Gum (eyeball gumballs), Chocolate Frogs (chocolate frogs made from frog shaped chocolate molds), Remus' Werewolf Fangs (candy corn), and Golden Snitches (made by hot gluing feathers onto gold foil wrapped chocolates). You'll also want to serve a simple Harry Potter themed cake... a crest or a Quidditch cake. Hockey party food - Every hockey party needs a fully stocked "canteen". 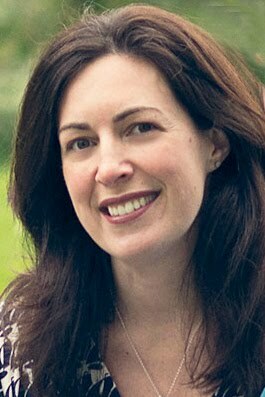 A simple backdrop can be made with a piece of dollar store foam core, hockey tape (around the edges of the sign), a team log, and a computer printout. 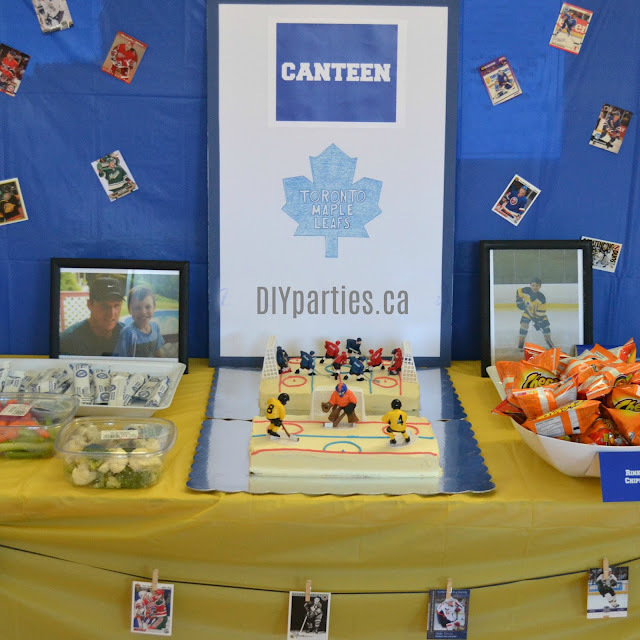 You'll also want to stock the canteen with rink chips, hockey pucks (chocolate cookies), playoff pizza, and Olympic hockey gold coins (chocolate gold coins). And don't forget the hockey rink cake! 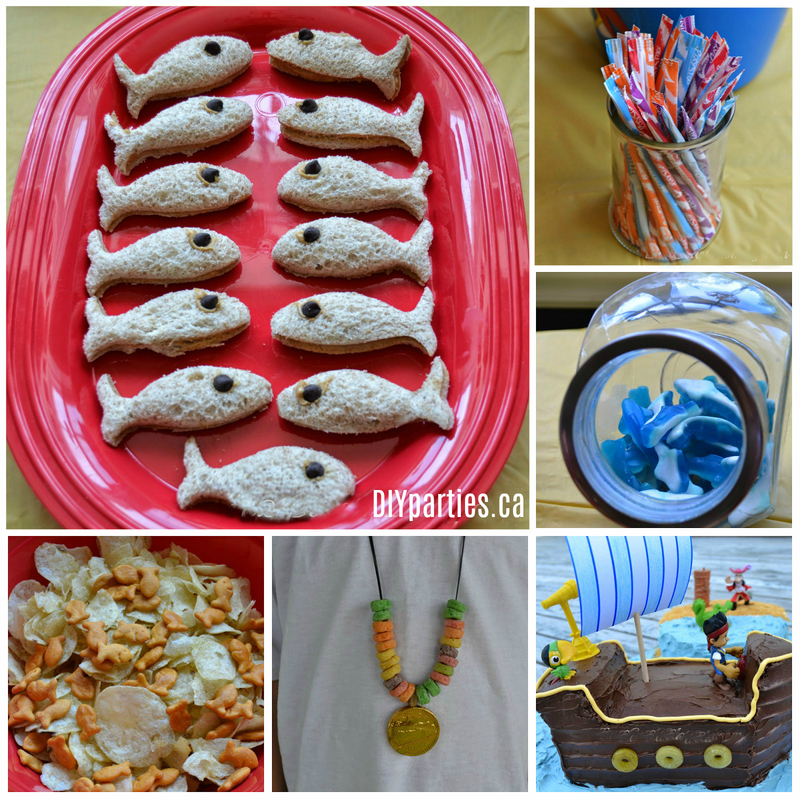 LEGO party food - Fun food options provide the building blocks for a successful LEGO party. Set the stage with a backdrop of giant LEGO men made from coloured paper taped to dollar store foam core sheets. A LEGO cookie decorating station is another fun option. 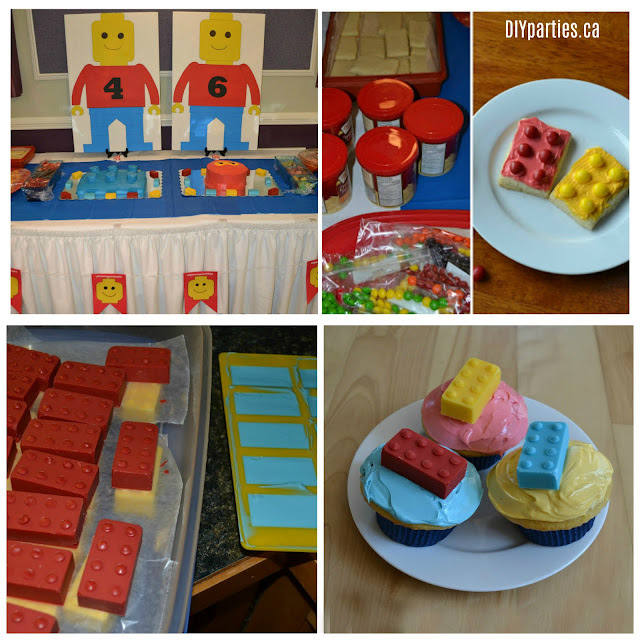 Rectangle cookies, coloured icing, and coloured candy can be put together to make fun and simple LEGO cookies. And chocolate LEGO bricks make yummy treats and wonderful cupcake toppers. And, of course, you'll also need some fun and simple LEGO cakes. Movie party - Movie parties are ALL about the snacks. To create a fun concession stand, make a simple backdrop using a piece of dollar store foam core or a dollar store tablecloth to match your colour scheme. You'll also want to serve traditional movie treats like popcorn, chocolate, candy, juice, and pop. Make sure you have plenty of treats that guests can easily grab and enjoy in their seats during the show! Pirate party food - There are lots of great options for pirate party food. "Fish" sandwiches can be made by using a fish shaped cookie cutter to cut out peanut butter sandwiches... just add a chocolate chip eyeball. You can also serve: pixie sticks (filled with Tinkerbell's pixie dust), fish and chips (chips and goldfish), gummy sharks, and (chocolate) gold coin necklaces. Simple pirate cakes can be served too! Pool party food - Set a party food table with a blue table cloth and a beach/pool themed backdrop. 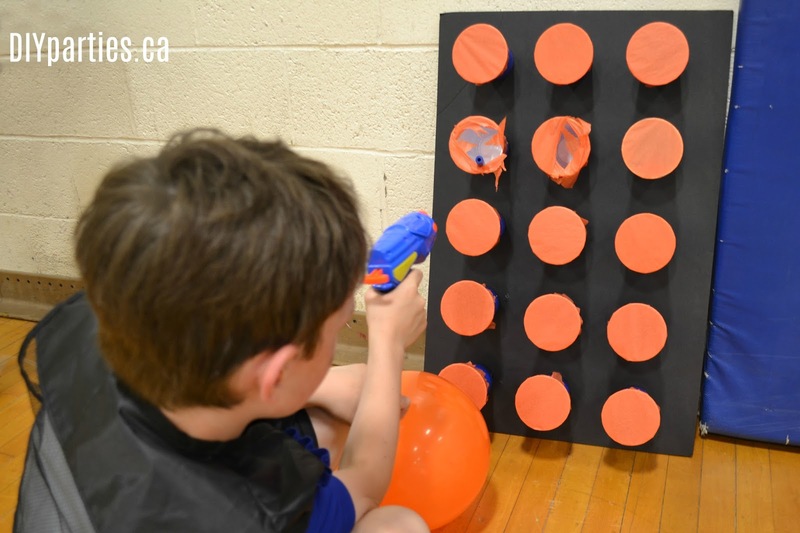 Use pool noodles, beach balls, and dollar store foam core decorated to match the theme. Then, serve food like: chips in (new and clean) beach buckets, gummy sharks, goldfish, fish and chips (chips mixed with goldfish), pool noodles (liquorice), and pool water (blue juice). 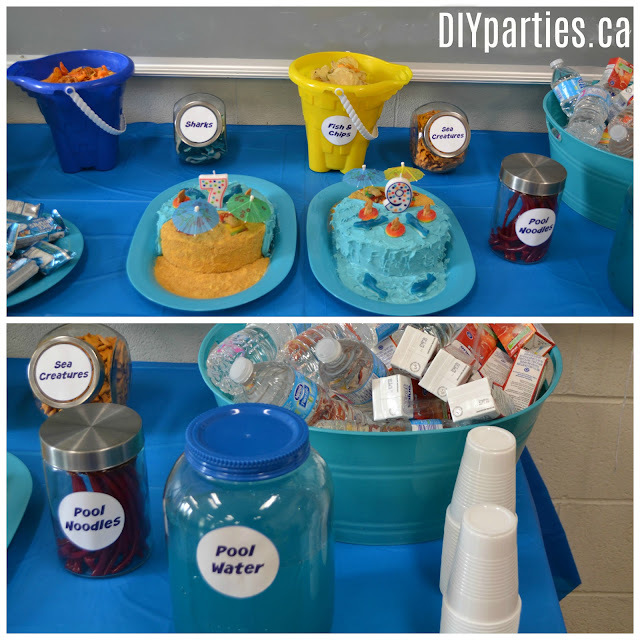 You can also serve simple pool party cakes made with blue icing, sand (graham cracker crumbs), gummy candies, and drink umbrellas. Red and White buffet - A strong colour scheme creates a cohesive and professional-looking food table at parties. Using inexpensive containers and carefully chosen food makes it easy to create an impressive buffet. 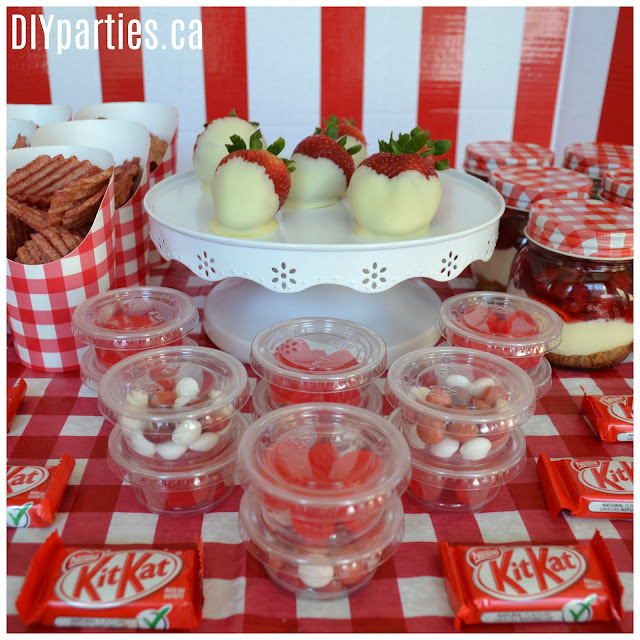 I love red and white for a carnival, Canada Day, or picnic theme. 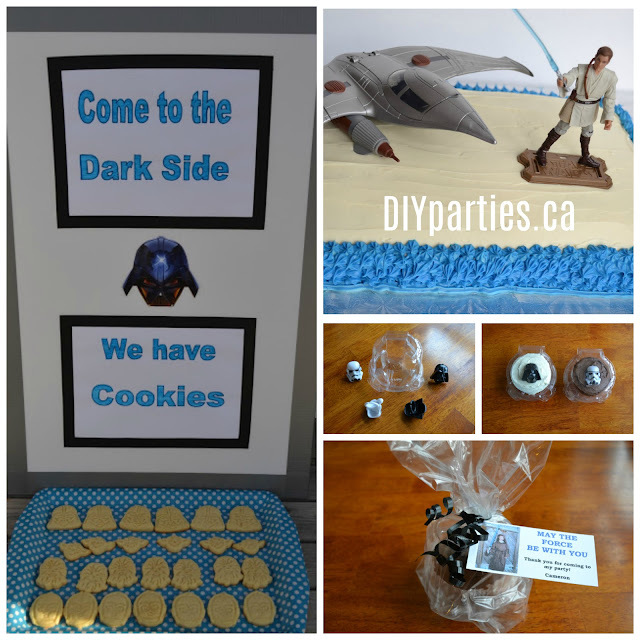 Star Wars party food - Pinterest is full of fun Star Wars party food ideas, but my favourite idea is to serve cookies with a "Come to the dark side... we have cookies" sign. It's easy to make with some computer printouts, tape, and a piece of foam core from the dollar store. Serving cupcakes topped with Star Wars rings or trinkets is also fun... and they make perfect party favours too. And don't forget the cake! A simple Star Wars cake can be made by topping a simple sheet cake with Star Wars toys, and the birthday boy/girl will love the extra present. 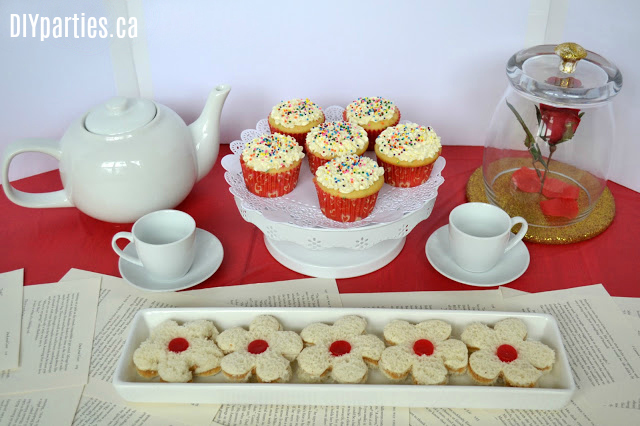 Tea party - Tea party food is simple. It's all about the tea (or juice), tiny sandwiches, and cakes. Check out my favourites here. 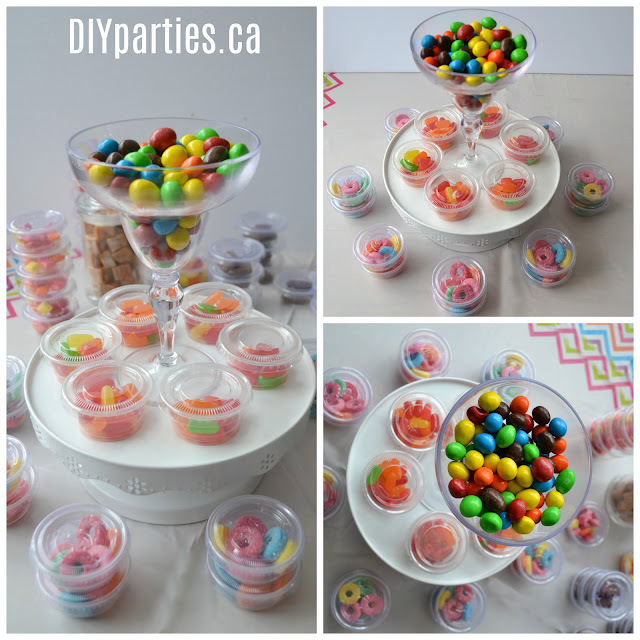 Serve treats in a variety of colours or in just one or two colours that match the party theme/decor. Playing with colour creates a wonderful visual impact. Use cake stands, boxes, books, etc... to create different levels of food/treats. Serve some foods in individual containers so that guests can grab them easily. It also allows you to buy in bulk and control serving portions. The food you serve at a gathering can really can make or break a party. Make sure there is plenty of food, add some DIY details, and display the food in a fun and deliberate way. And... don't forget to have fun!